What makes us different here at EquipCalendar? We understand the stakes for the rental equipment owner. We know that you aren't working for a paycheck. You are working for your life and livelihood. The lines between your business and your life are thinner than anyone else you may know. That's part of the reason we developed our application as mobile first. Any time a customer calls you may be in the office or out in the field. You may use a tablet or a smartphone. You are using what works in your business and in your life. We respect your bottom line. We know that you are much closer to your bottom line and someone at a larger company. We also know that, most of the time, your bottom line is much closer to your personal income. We could be one of those companies that charges extra fees for every stage of your growth. An extra charge for two more users or 50 more pieces of equipment or 250 more events per year. How much respect for you and your bottom line is in that pricing structure? None. That's why we offer a flat fee for the whole year and why we'll never raise rates on an existing customer. You could be with us for 10 or 20 years, but we'll never charge you more than the day you signed up. Simple. Respectful. Honest. Much how you treat your own bottom line. We leverage simplicity to create more time for you to run your business. Our software is the simplest rental equipment software out there and we're kind of proud of that. That simplicity means that anyone can be quickly up and running with our tools. What's needed for inventory configuration? A description of the of equipment or asset and the maximum quantity you have available. What's needed for a rental? The times that are important to the client and yourself, the event and customer contacts, and lastly, the inventory they'll need to rent. If you or your employees, even new employees, don't understand the software in the first 5 minutes, we have failed you. We don't think that will happen. If there is any complexity at all, it's in the flexibility of our calendar views. You may run your business using Day, Week or Month views. You may need to analyze your inventory availability. Your information is never more than two clicks away, so you can get back to the running of your business as soon as possible. 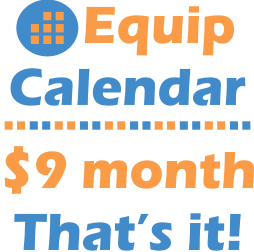 If you'd like a free 14 day trial of EquipCalendar, just click here. Absolutely no credit card required. One of the handy features is ability to send your driver out with a simple to follow work order. It contains all of the important information about the event but also provides fields for the driver. What time did they arrive/dropoff/setup or teardown/pickup? How much inventory was scheduled, delivered and picked up. Are there any additional notes concerning damage to the inventory? Free 14 day trials have launched! Today, we're proud to announce a 14 day free trial of our equipment rental software. Best of all, no credit card is required to get started. At the end of 14 days, a regular subscription costs just $59 a year thereafter. It's simply the best deal in inventory management software around. Check us out, it's FREE!